She wins the CONCORSO INTERNAZIONALE VOCI NUOVE ROSSINIANE promoted by RAI Radiotelevisione Italiana and has her debut at the Scala di Milano with Rossini's CENERENTOLA in the celebrated Abbado-Ponnelle edition, role that she will perform in all the world's most important theaters, the Lyric Opera di Chicago, the Festival of Aix en Provence, the Colòn of Buenos Aires, the Staatsoper in Wien, the Bunka in Tokyo and, with the tours of the Teatro alla Scala, at the Bolscioj of Moscow, At the London's Covent Garden and at the Kennedy Center in Washington. In Los Angeles with Carlo Maria Giulini she debuts in the REQUIEM of Verdi and Quickly in the Verdi's FALSTAFF. She takes part in the opening spectacle of the Stagione Scaligera 1978-79 as Marina in BORIS GODOUNOV of Moussorgsky, directed by Claudio Abbado and immediately after se goes in two tours: one in East Europe, the other in Japan, with Rosina in the BARBIERE DI SIVIGLIA of Rossini and the REQUIEM of Verdi. In Japan she is present with the Staatsoper of Vienna in IL VIAGGIO A REIMS by Rossini, directed by Claudio Abbado. In 1981 Lucia Valentini Terrani wins the PREMIO ABBIATI from the Italian musical critic, as best female interpreter. With MIGNON of Thomas directed by Georges Prêtre, she starts the Season 1983-84 at the Comunale di Firenze. In these years, besides the roles already mentioned, She is often Ersace in the SEMIRAMIDE of Rossini, Carmen in the CARMEN of Bizet and Orfeo in the ORFEO ED EURIDICE of Gluck. She sings in the REQUIEM of Verdi in Vancouver directed by Lorin Maazel with the groups of the Teatro alla Scala di Milano. 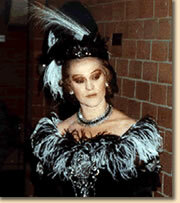 In 1996 at the Festival of Martina Franca she triumphed with the LA GRANDE DUCHESSE DE GEROLSTEIN of Offenbach. She is regular guest at the ROSSINI OPERA FESTIVAL DI PESARO where she already sang LA DONNA DEL LAGO, IL VIAGGIO A REIMS, MAOMETTO II and two productions of TANCREDI. With Michele Campanella at the piano she presents a series of Shumann in the largest concert societies. She helds her recitals all over the world.